Major plans are plans of city-wide or corporate-wide significance. Major plans act as foundation blocks for Administration decisions and recommendations to City Council. They are also a fundamental building block for future Council decisions. These plans are meant to be in place for multiple years, and the review of these plans takes significant time and resources by both Administration and Council. This process, which also includes the City Vision for 2040, the 10-year strategic plan, the Ecovision, and the plan for downtown, is broadly called "Transforming Edmonton." We’re admitting, as a people, that we have made expensive and dangerous mistakes for a generation or so. "This is what we heard from our stakeholders in 2006, about the direction they wanted our city to take. A different approach, more integrated, a little braver." Many Edmontonians have noted that the last plan to be approved, The Way We Finance, is the one that’s supposed to help us pay for the rest! Still, when its approval finally happens later this year, it’ll bring the most ambitious planning cycle in the City of Edmonton’s history to a close. Mandel’s win, though hardly a surprise, was much more than a ho- hum victory over the fringers, fanatics and languid Koziaks who ran against him. His approval rating on Monday narrates a turning point in Edmonton’s history. If Mandel’s first term stood for anything, it was a shift away from historic nickel-and-dime civic politics. Edmontonians, it seems, embrace Mandel’s big-city vision. The success or failure of an effort as broad and ambitious as Transforming Edmonton cannot be attributed to one person of course, but under Mayor Mandel’s watch, the City became a bit more integrated and much more strategic. Edmonton’s efforts at improving the visioning and planning process are not unique. Vancouver’s CityPlan was adopted in 1995 and is slated to come to a close in 2015 (to be replaced with Green Vancouver, I think). 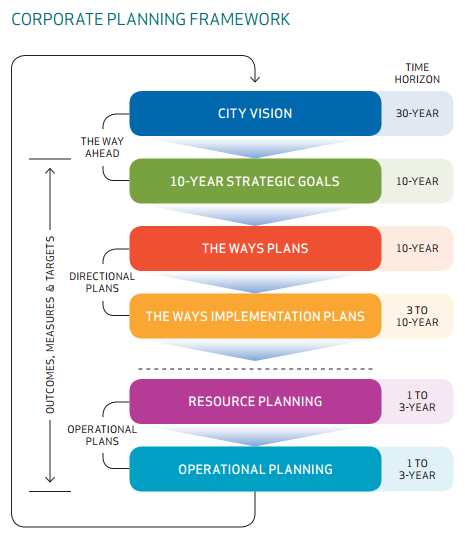 Toronto’s Strategic Plan was approved in three stages from 1999-2001. Ottawa adopted its Official Plan in 2003 to guide the city through 2021. Montreal’s Master Plan was adopted in 2004. Calgary adopted imagineCALGARY in 2006, which sets out a 100 year vision with targets every 30 years. Winnipeg replaced its previous Plan Winnipeg 2020 initiative with OurWinnipeg in 2011, presenting a 25-year vision for the city. Long-term planning seems to be the norm for Canada’s major cities. Today nearly every aspect of the City of Edmonton’s operations have been affected by Transforming Edmonton. For example, every budget item references one of “The Ways” and/or the strategic goals, and internal structures have changed to match the new approach. We’ve also seen efforts to describe progress, such as the new Citizen Dashboard. While some implementation has occurred, the focus of the last five years has unquestionably been on the creation of Transforming Edmonton’s plans and associated documents. The approval of the final major plan, not to mention the expected retirement of Mayor Mandel next week and April’s unofficial kickoff of campaigning for the October municipal election, should signal a shift toward more concerted implementation efforts. A shift in focus from planning to implementation won’t just happen, however. Edmontonians need to demand it. We as citizens need to do a better job of asking how things are going, not just how things are going to be.